Le très attendu nouveau chapitre de Dark Mirror est disponible (texte et image trouvé sur Biosector01), on apprend un peu plus sur l'attaque du Colisée, qui n'est pas vraiment une réussite (résumé à venir). Takanuva crashed behind a wall, a wounded Lesovikk beside him. All around, Elemental Power bursts were flying, warriors were screaming and a disaster beyond his imagination was taking place. It had all started out so well: Lesovikk's van had made it close to the Coliseum before being spotted. As planned, Takanuva had used his new found Shadow powers to blind the guards. Pohatu followed with a massive fist of stone that cracked the walls of the huge structure. To the east, Makuta Teridax let Krika, Kojol, Turaga Dume and Takua into battle. At first, they made short work of the Matoran and Toa who guarded Tuyet's fortress. Then it all went wrong: a Toa of Iron appeared on the walls and a hail of spikes spelt the end of Takua. Takanuva watched in sheer horror as his other self collapsed and died. Kojol fell next, his armor crushed by the Toa's power, and his essence incinerated by a Toa of Plasma. Teridax was forced to pull back. Things were going no better for Lesovikk's squad. Primal had run into Tahu in the eastern entrance, and killed the Toa of Fire. But the sudden appearance of Gali, and a sphere of Water around the Dark Hunters' head left him to drown on dry land. Toa Krakua hit Gali with a wave of solid sound, blasting apart her mask and armor. Pohatu cried out too late: Ahkmou had already dashed ahead and slain the fallen Toa of Water. He didn't get to enjoy his triumph long. Kopaka flash-froze Akhmou, and a swipe from Onua's claws shattered the Matoran into little pieces of crystal and Protodermis. "Now," said Lesovikk to Takanuva, "Darkness will lead the way. Get in there and do what you have to." Takanuva took one last look around. Nuju was side-by-side with Guardian, keeping a Toa of Magnetism too off-balance to use his powers. Teridax's forces had charged again. Krika used his Vacuum power to absorb ruthless attacks and Teridax summoned a bolt of Lightning, powerful enough to turn a Toa into ashes. Darkness was already on the move, slipping through the cracks in the Coliseum walls. Takanuva used his Shadow power to enlarge them and followed. Inside the Coliseum was strangely silent. One would never know a battle raged outside it's walls. A team of Toa rushed by on their way to join the fight. Stealing himself, Takanuva fired laser blasts at the ceiling, bringing the rubble down on top of them. He still found himseld hoping he had only stunned them, not killed them. Together, Toa and Dark Hunter fought their way to their goal: the Hall of Masks. They had made it to the chamber door when Darkness paused. He heard something. The next instance, the door exploded outward as a wall of Water erupted from within, sweeping Darkness away. Takanuva managed to grab hold of the doorway, holding on with all his might and holding his breath. Outside, Teridax's attack had met with success as Toa fell before him and Krika. Turaga Dume had rallied Lesovikk's group, although not before Nuju had been pulled into the Archives by plantlife gone wild. Guardian, too, fell, but took half a dozen Toa with him. Back in the Coliseum, the damage had finally stopped. There, framed in the chamber doors was Toa Tuyet; Nui Stone in one hand, Mask of Dimensional Gates in the other. "I know who you are," she said, "Or rather, I had guessed. You don't belong here." "Neither do you," said Takanuva, "You don't exist in my world. True Toa must have stood up and stopped you before you went too far." "In my world, I am much more... confident," she replied, "How unfortunate for you." "Alright then," said Takanuva, "For Takua, for Lesovikk, and for all the Toa and Matoran whose lives you have ruined, I strike." Tous ces morts ! 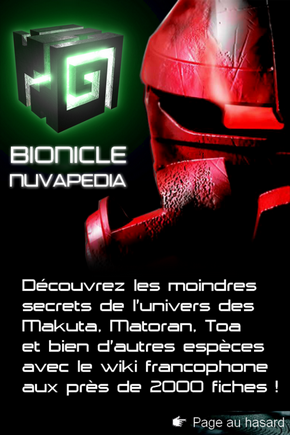 Bionicle va devenir interdit aux moins de douze ans si ça continue ainsi. J'ai l'inpression que Greg Fashey a inventé ce monde parallèle justement pour pouvoir se lâcher complétement et infliger à ses personnages ce qu'il ne peut se permettre de faire habituellement. Très bon chapitre, cela dit, très dramatique. on pourrait avoir une petite traduc',ou du moins un résumé?